Have you seen The Last Of Us Part II trailer yet? If not, what are you waiting for? Sony released a new Last Of Us Part II trailer during their E3 presentation Monday, and it’s the most revealing look we’ve received yet. Ellie is a bit older in the new trailer, and also a bit more experienced in the post-apocalyptic survival department. The first minute or so of what we see is just a cutscene, but after Ellie gets tender with Dina (her new girlfriend) we cut to a decidedly different moment where she’s knifing a maniac in the face. Things get graphically violent from there as Ellie sneaks around, trying to avoid her pursuers whenever possible and slashing their throats when not. Those who’ve played the original Last of Us will notice similar stealth gameplay being utilized here, but since that’s part of what made the first game so great, more is what we want. We’ve learned some more about the game since this trailer was revealed. Last Of Us Part II WILL have a multiplayer mode, says Anthony Newman, co-director. “There is going to be multiplayer with the game. We’re really excited to share details about it, but that’s going to be at a later date,” he told Polygon. The original game had a multiplayer mode called Factions that utilized deathmatch and team-deathmatch gameplay. What no one has revealed yet is a release date, or even a general release window. The game’s completion is still a ways off. 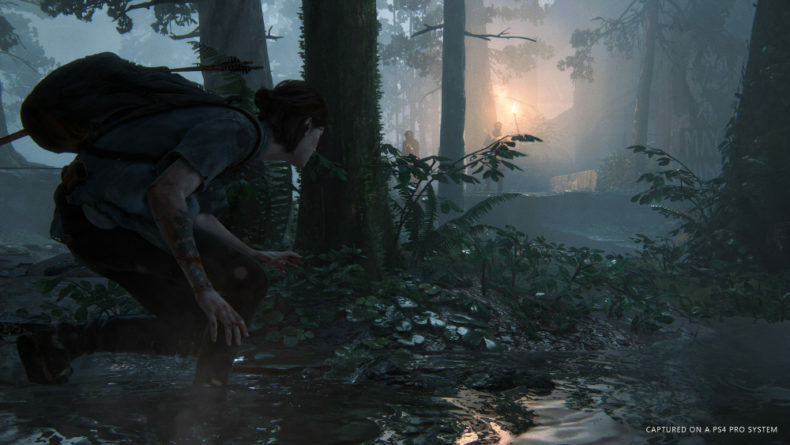 The Last Of Us Part II is currently under development at Naughty Dog Studios for Playstation 4.